This is the first post of this “short” stay in Thailand (one month, only), my 5th visit in the “Land of smile”, since 2006, but …with my family, this time ! Bangkok has a tremendous lot of hotels and guesthouses, but of course, my own “dream” place in this turmoil, is Thewet.This quarter has loads of advantages, it is located near Chao Phraya river, and therefore allows us to move about, by boat very easily. It’s no so invaded by tourists than Kao san road, a larger traditional and busy market within the place, with also a flower market along the little canal. 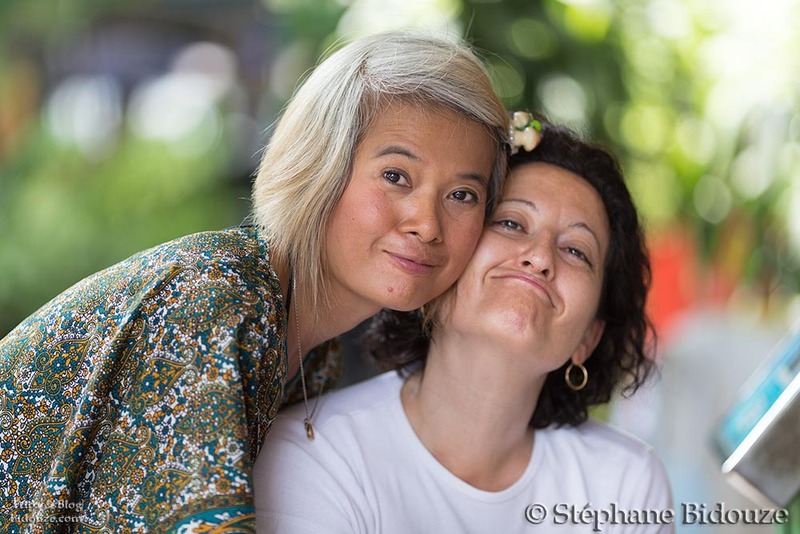 On the opposite side, the usual guesthouses like Sri-Ayuttaya and Tavee (i did mention them before, in 2011) loose some of their genuine character because of an increasing number of visitors these last few years. 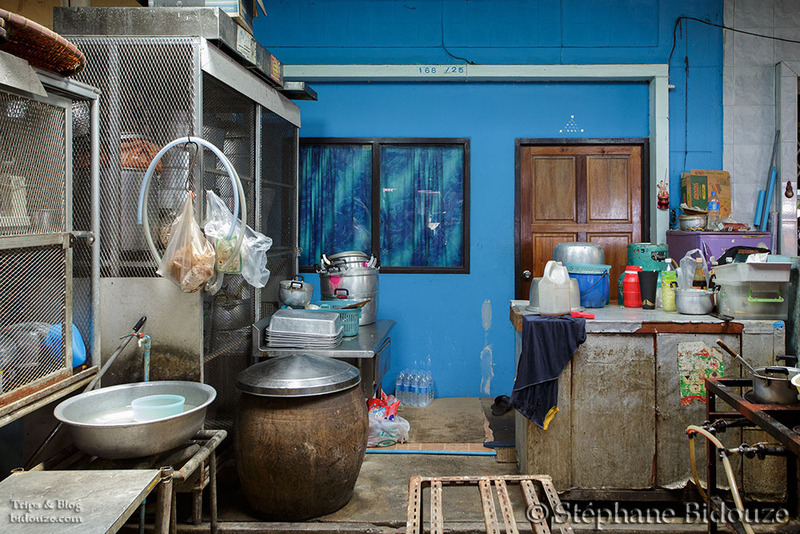 The Taewez guesthouse has really good standards, simple and clean, although the owners don’t show much feelings… but a pretty “cold” attitude. Just opposite the hotels, Sri Ayutthaya has street houses, street canteens and of course a Seven/Eleven chain store, that, you will find all over Asia. Amongst these shops, Yud’s little business welcomes you, with her usual kindness and sweet madness. It’s lovely to seat there, on a wooden stool, sipping one of those delicious fresh fruits juice, a black coffee, or a green tea, while watching this hectic life going on …. 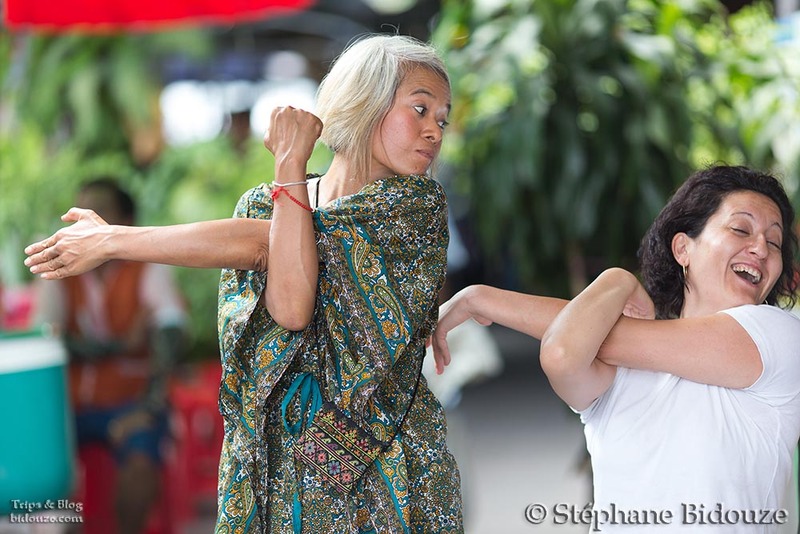 Yud donne des cours de Yoga improvisés, dans la rue. The night is about to fall, on this very first day, the jet lag is not just a feeling, we are worn out….but we cannot resist to a good meal waiting for us at the ” In Love” restaurant. 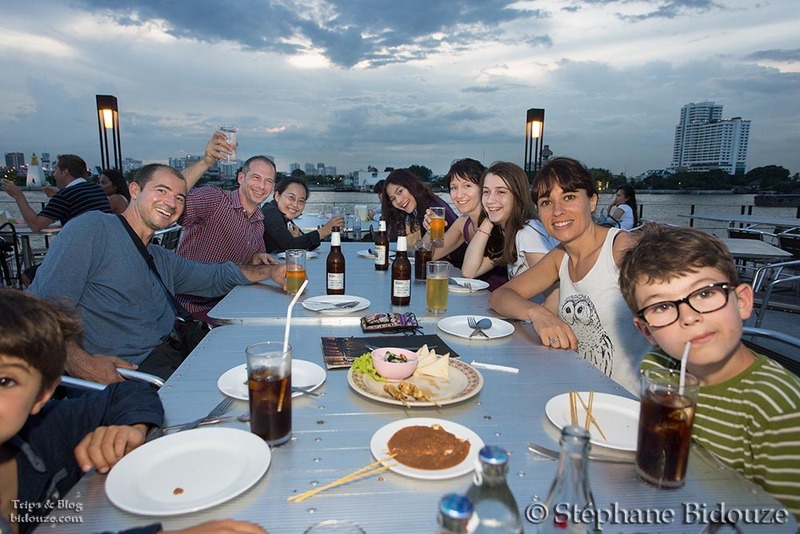 It has a large wooden terrace on the Chao Phraya river. A nice way to meet again with my friend Sita, and also : a terrific event : my “small” cousin who comes straight from Switzerland with her family !! 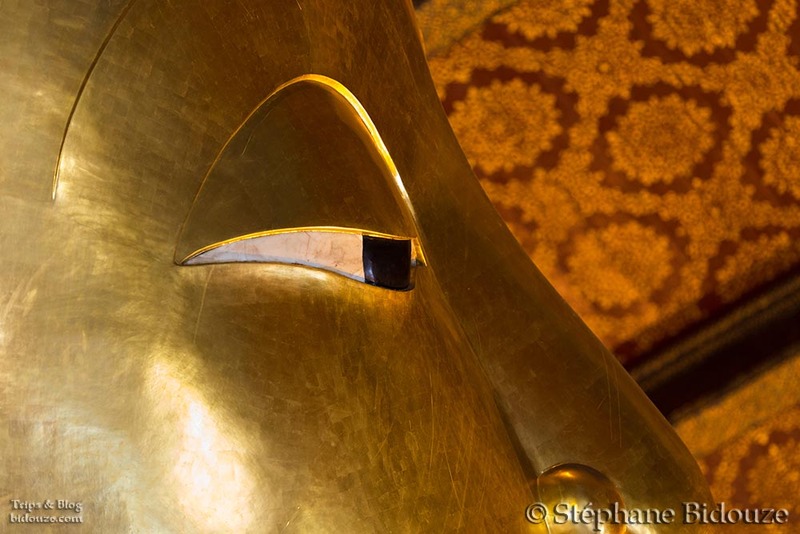 The next day we visit Wat Pho, with it’s huge laying down Buddha, usual visit for me, but with always the same feeling : it’s marvelous ! 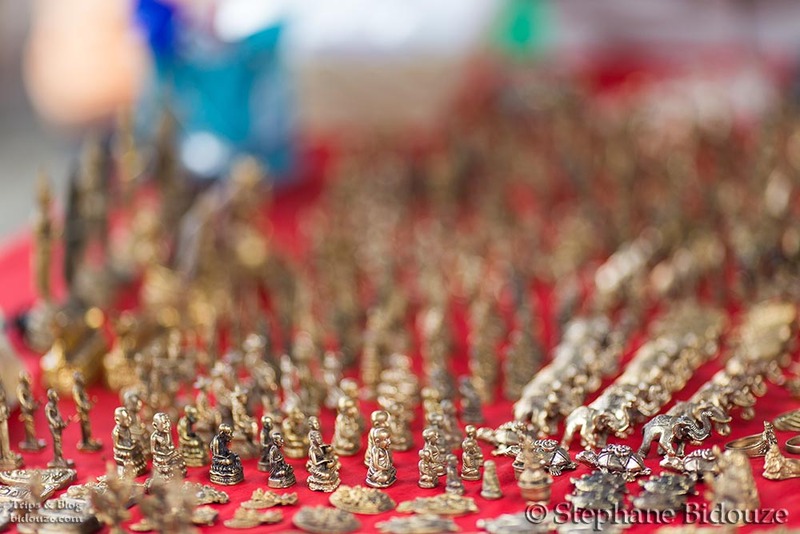 Nearby the temple, the amulets’market goes on several hundred meters, Thais are very superstitious and believe in their powers of protection against accidents, most amulets are representative of a gold Buddha, and are pendants. 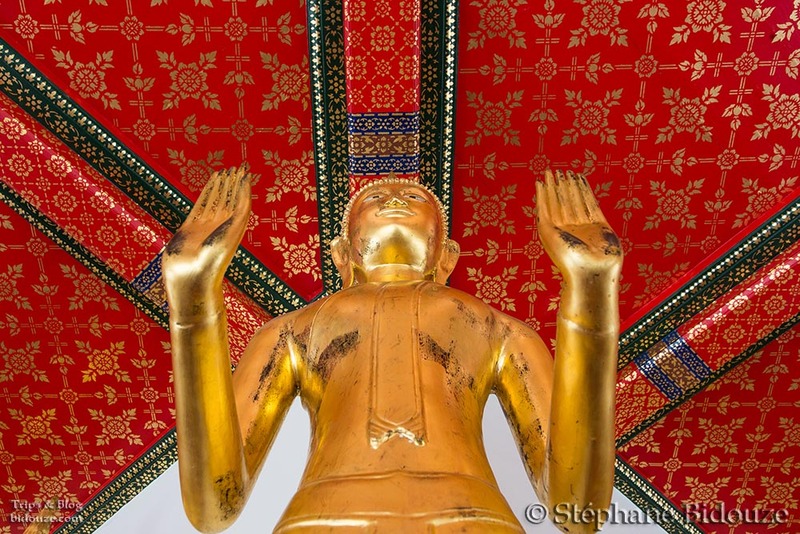 Le dessous des pieds du Bouddha sont ornés de motifs en nacre. Thanks to Martine for the translation. November 2013, street protest against the amnesty bill in Bangkok. 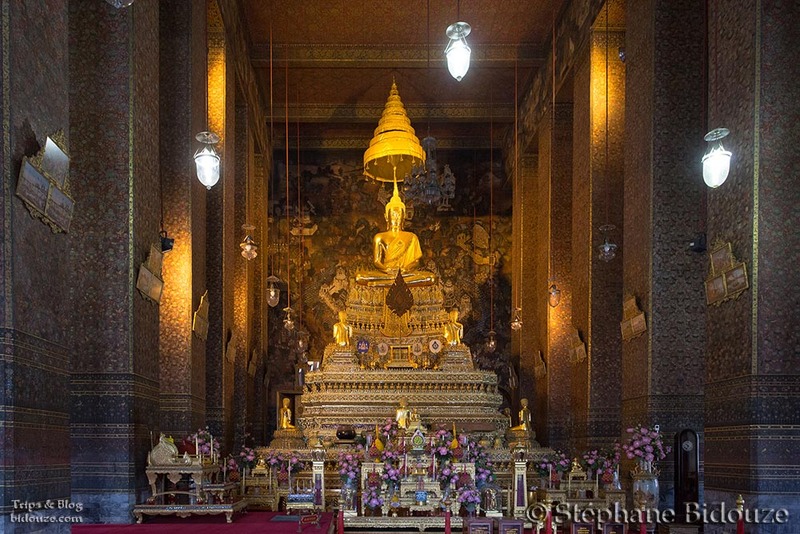 gold Buddha…. 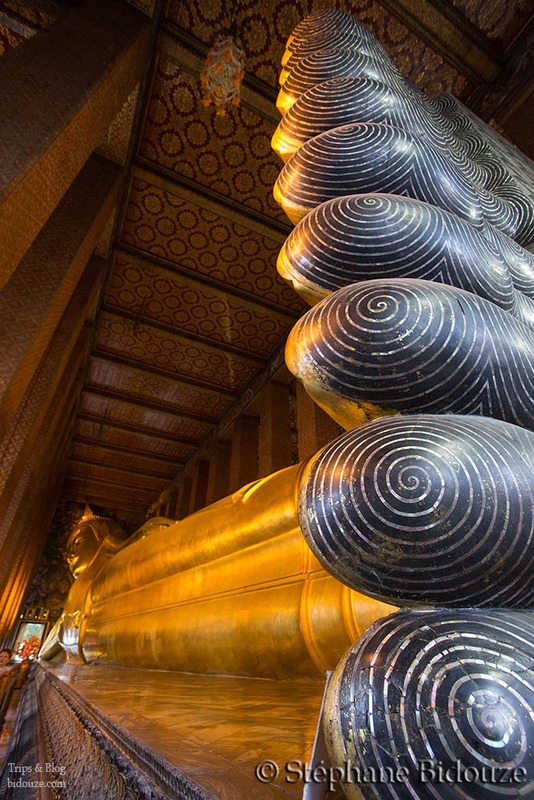 huge laying down Buddha…. marvelous indeed….